Upside, it is a great job and Nancy will be back doing what she truly loves and knows. Downside is her territory is three states and she will often be away from home during the week. Funny, in the past it was me traveling all the time. anyway, where was I? OH, yeah, so I am watching it as I began to put down some thoughts for y'all today and like I said I have not really watched it in 3-4 years, but dang, they have some good voices on this season. Don't know their names, but dang - OH i said that already...HECK-A-DOODLE there is some talent there. Ms Lopez is still looking fine and is much easier to take than Pawler and actually does give some interesting suggestions, but also fawns quite often. And, what Randy is now the tough guy? Getting the boos from the audience? Not the DAWG? Interesting. And having big time producers is certainly different. What sports are on TV... Baseball starts in just a few weeks..ah salvation! 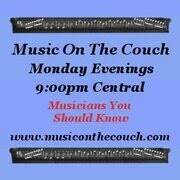 Hey, have you heard Music On The Couch and my interviews with Lucy Hammond and J.P. Corwyn? Lucy Hammond has this big bold personality and is funny as hell. Then J.P. Corwyncomes on and it was like my long lost red-headed stepchild brother had escaped the attic (ya gotta listen to understand) and was on the show with me. And Lucy stayed around and I popped her phone live and the three of us just got crazy while talking about their lives and their music.They bonded and will be talking about sharing resources. And Dusty from Robodrum was in chat (as he always is, loyal fan that he is), and he had some things he and JP were going to talk about. AND...you will find out what happens when J.P., Lucy and Dusty have a hit record and are given a Grammy! OH the wonder of it all! Hope you take the time to listen and let me know what you thought. See y'all tomorrow with another FIVE ON FRIDAY! There's a singing television? Huh. Who knew? I am actually watching Idol...Durbin is well known in my circle. Yeah for Nancy on the new job, hope she enjoys it all. I agree there are some good voices this season. It's enough to keep me interested. Not enough to watch it live and vote, but enough to record it and watch on the weekend. Yeah for Nancy and the new job!!! I'm not watching this season, but I do turn it over to the show for a while each week just to get a little JLo action. I do love her so. I like the singing shows and the dancing shows. I work evenings so miss lots of them but have been watching our ice skating show on bbc iplayer (which I love! ).